The tunnel has been designed for 6 m3/s capacity to bring 510 million liter per day (MLD) water from Melamchi Valley to Kathmandu Valley and present project is designed for transferring 170 MLD water from Melamchi River. Additional 340 MLD water will be transferred through the tunnel with implementation of separate project later. The Melamchi Water Diversion Scheme includes construction of headworks and water diversion tunnel of approximately 26.0 km from Riberma Intake (Sindhupalchowk) to Sundarijal outlet – Kathmandu.The total lengh of tunnel to be constructed is 27.584 km including three adit tunnels,headworks diversion tunnel of 235 m ,a 39 m flushing tunnel at Ambathan adit alongwith a 46 m access tunnel on the way to Headworks. The tunnel construction work sites are located at three adit sites and connected by the outlet portal at Sundarijal in Kathmandu and Adits at Sindhu, Gyalthum and Ambathan in Sindhupalchowk. 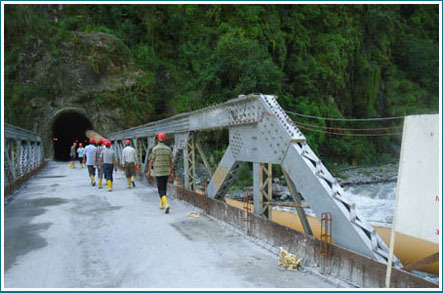 The longest stretch of the tunnel construction section is of the length of 6.1 kilometer from Sundarijal portal site. The current contractor is CMC Di Ravenna of Italy for construction of Headworks and tunnel under MDS/DT/02. The construction work was started from January 2014 at Sundarijal upstream side . The total Tunnel lengh excavated by the current contractor till the end of December 2017 is 20.64Km out of 21.145 Km tunnel.The cumulative total length excavated to this date is 27.061Km.The final finishing work of tunnel including tunnel invert concrete is also started after sundarijal Sindhu 9.344 Km section Breakthrough took place on 28 December 2016.The total finiching work completed by the end of 2017 is 700m from Sindhu upstream site. For Construction of Headworks and other structures the contractor has complted the open cut and rock suppoert work at Headworks Site.Completed around 100 thousand cubic meters of opencut at Headworks site. Adit Access Road (AAR) – AAR refers the roads to reach to different Adit points of the project sites which include – Sindhu Adit (Bahunepati – Sindhu Adit ,15.4 km), Gyalthum Adit (Shera to Gyalthum Adit, 4.2 km) and Ambathan Adit (Timbu – Main Intake at Ambathan Adit, 0.70 km). Main Access Road (MAR)– MAR refers the road from Melamchi Pul Bazar to Timbu which length18 km long including 10 bridges. This portion of the road has several local and international contractors in joint ventures. This road consists of 10 bridges and is the most complex part of the access road construction. Upgrading Access Road (UAR)- Upgrading of Jorpati-Sundarijal road (6.0 km), Jorpati Gokarna-Narayantar and Lamidanda – Melamchi Pul Bazar – Timbu (feeder road), 22.2 km. Construction of approximately 235 m length of road as an extension of the Sundarijal AAR up to Sundarijal Portal; and Construction of approximately 45 m length of road to access the Sindhu Adit portal. This refers the construction, operation and management of Camp site office at Malamchi Pool Bazar (main Camp) and Other Camps at Ambathan Adit, Gyalthum Adit, Sindhu Adit and Sundarijal Adit. China CMIIC Engineering Corporation – The accommodations for Empplyer, DSCs and themselves in all adit pointes – Sundarijal, Sindhu, Gyalthum and Ambathan. Also it is the responsibility of MDS contractor to operate and manage existing camp site office providing all sorts of service utilities.